This data set provides estimates of 3-hourly net ecosystem CO2 exchange (NEE) at 0.5-degree resolution over the state of Alaska for 2012-2014. The NEE estimates are the output are from Geostatistical Inverse Modeling of a subset of CARVE aircraft CO2 data, WRF-STILT footprints, and PVPRM-SIF data from flux towers (CRV: located in Fox, AK and BRW: located just outside Barrow, AK). Daily mean NEE is also provided as calculated for all of Alaska and for four sub-regions (0.5-degree resolution) that were defined across Alaska, based on general landcover type: North Slope Tundra, South and West Tundra, Boreal Forests, and Mixed (all other). Also provided are derived annual carbon budgets for (1) all of Alaska with defined contributions from biogenic, fossil fuel, and biomass burning sources and (2) annual biogenic carbon budgets for the four landcover-type regions of Alaska. Provided for completeness are the CARVE aircraft atmospheric measurement data used in estimating NEE. This data set includes 9 files in total. The 3-hourly net ecosystem exchange (NEE) is in netCDF (*.nc) format. There are four tabular data files in comma-separated (*.csv) format containing daily mean NEE, carbon budgets, and CO2 column profiles from CARVE flights. Four maps of the regional landcover types are provided in geotiff (*.tif) format. This data set provides estimates of 3-hourly net ecosystem CO2 exchange (NEE) at 0.5-degree resolution over the state of Alaska for 2012-2014. The NEE estimates are the output are from Geostatistical Inverse Modeling of a subset of CARVE aircraft CO2 data, WRF-STILT footprints, and PVPRM-SIF data from flux towers (CRV: located in Fox, AK and BRW: located just outside Barrow, AK). Daily mean NEE is also provided as calculated for all of Alaska and for four sub-regions (0.5-degree resolution) that were defined across Alaska, based on general landcover type: North Slope Tundra, South and West Tundra, Boreal Forests, and Mixed (all other). Also provided are derived annual carbon budgets for (1) all of Alaska with defined contributions from biogenic, fossil fuel, and biomass burning sources and (2) annual biogenic carbon budgets for the four landcover-type regions of Alaska. Provide for completeness are the CARVE aircraft atmospheric measurement data used in estimating NEE. Carbon in Arctic Reservoirs Vulnerability Experiment (CARVE) is collecting detailed measurements of important greenhouse gases on local to regional scales in the Alaskan Arctic and demonstrating new remote sensing and improved modeling capabilities to quantify Arctic carbon fluxes and carbon cycle-climate processes. Ultimately, CARVE will provide an integrated set of data that will provide unprecedented experimental insights into Arctic carbon cycling. Commane, R., Lindaas, J.O.W., Benmergui, J., Luus, K.A., Chang, R.Y-W. , Daube, B.C., Euskirchen, S., Henderson, J., Karion, A., Miller, J.B., Miller, S., Parazoo, N.C., Randerson, J.T., Sweeney, C., Tans, P., Thoning, K., Veraverbeke, S., Miller, C.E., and Wofsy, S.C., 2017. Carbon dioxide sources from Alaska driven by increasing early winter respiration from Arctic tundra. Proceedings of the National Academy of Sciences. NNX13AK83G, NNXNNX15AG91G and 1444889 (through JPL), the NSF AON program (#1503912) and the USGS Climate Research and Development Program. This data set includes one file in netCDF (*.nc) format containing 3-hourly net ecosystem exchange (NEE), four binary maps of land cover in geotiff (*.tif) format, and four tabular data files in comma-separated (*.csv) format containing mean daily NEE, carbon budgets, and CO2 column profiles from CARVE flights. The netCDF (oNEE.nc) provides aircraft-optimized CO2 flux (net ecosystem exchange) data in 3-hourly intervals. Data fields within the netCDF file are described in Table 2. The four geotiff files included in this data set provided the spatial coverage for which net biogenic carbon budgets were calculated: Forest_Interior_AK.tif – boreal forests of interior Alaska; Tundra_Cover_North_Slope.tif – North Slope tundra; Tundra_Cover_Yukon_Kuskokwim.tif – Yukon-Kuskokwim Delta of south-west Alaska and the Seward Peninsula; and Mixed_Landcover_AK.tif – mixed areas or areas of Alaska not included in other regions. Biogenic carbon budgets were calculated from the aircraft-optimized CO2 fluxes for 2012, 2013, and 2014. Spatial data properties for the geotiff files are described below. Annual_Carbon_Budget_Region.csv and Annual_Total_Carbon_Budget_AK.csv provide the annual carbon budget by region and source, respectively. Rows in Annual_Carbon_Budget_Region.csv give the carbon budget in TgC yr-1 for the area of coverage provided in the corresponding geotiff: “NS” – Tundra_Cover_North_Slope.tif; “YK” – Tundra_Cover_Yukon_Kuskokwim; “IA” – Forest_Interior_AK.tif; and “Other” – Mixed_Landcover_AK.tif. Rows in Annual_Total_Carbon_Budget_AK.csv give the carbon budget in TgC yr-1 for three sources influencing CO2 concentrations: biogenic, biomass burning, and fossil fuel. Each file contains one column per year for the years 2012, 2013, and 2014. Tabular data file structure for the remaining files are described in Tables 3 and 4. This data set has been used to assess carbon fluxes and carbon-climate feedbacks in arctic and boreal Alaska by combining and comparing several complementary approaches which in turn will help to gain a more complete understanding of the Alaskan carbon budget and new insight into how arctic carbon fluxes may respond to future climate change (Commane et al., 2017). Calculation of the additive flux correction was required to match the modeled to observed column enhancements, within a given measurement period. The "column difference" calculated for each flight period is defined as the difference between the modeled and observed integrated CO2 columns.To represent the spatial distribution of the additive flux correction an inverse model was applied to the column difference for each two week flight period. The column differences vary between -0.25 to +0.45 mol m-2. The goal of the inverse framework is to find an optimal model of the additive flux correction that accounts for the spatial variations of the column differences for each flight period, leading to a spatially explicit, optimal estimate for the CO2 fluxes and annual budget for Alaska (Commane et al., 2017). According to Commane et. al., 2017, mean CO2 mole fractions were calculated from altitude profiles of CO2 concentration measured across Alaska during the Carbon in Arctic Reservoirs Vulnerability Experiment (CARVE) flights, spanning April-November in 2012-2014. For each aircraft integrated CO2 column, a high resolution transport model was coupled with a data-driven CO2 flux estimate to predict atmospheric CO2 enhancements associated with Alaskan land surface biogenic fluxes, and then the modeled integrated CO2 column was calculated. Profiles with carbon monoxide mole fractions exceeding 150 ppb were removed to exclude the influence of biomass burning and fossil fuel combustion. The influence of land surface fluxes for each of the 231 vertical profiles was calculated using the high-resolution WRF-STILT transport model. The proportion of particles located in the lower half of the planetary boundary layer determined the influence of surface fluxes on the measured mole fractions. The two-dimensional WRF-STILT footprint was calculated for each particle at 3-hour intervals on a 0.5- by 0.5-degree grid over the 10-day travel period of the particles. Ecosystem fluxes of CO2 were calculated using the Polar Vegetation Photosynthesis and Respiration Model (PVPRM) and enhanced by convolution with the land surface influence functions calculated from WRF-STILT. Additive corrections to PVPRM CO2 fluxes were obtained for each two-week aircraft measurement period using a geostatistical inverse model (GIM) to minimize the differences between modeled and observed column CO2 enhancements. 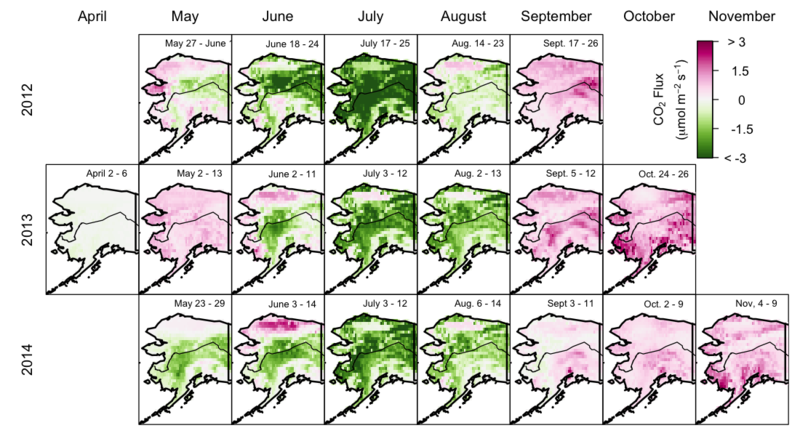 PVPRM fluxes and additive flux corrections (interpolated between two-week flight periods) were used to calculate regional-scale CO2 fluxes for Alaska during 2012-2014. The time-series of aircraft-optimized biogenic CO2 flux after additive correction is depicted in Figure 1. 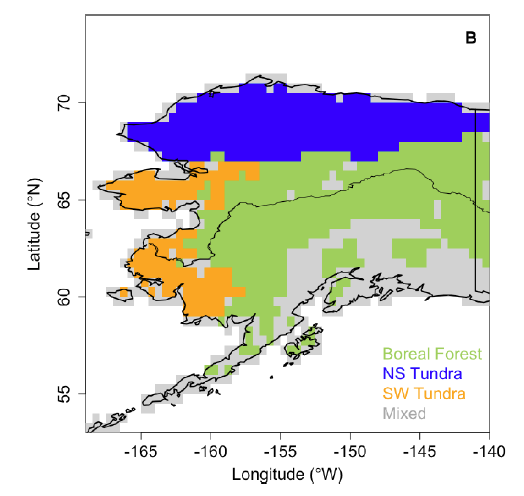 Biogenic carbon budgets were calculated for four Alaska sub-regions: North Slope Tundra (Tundra_Cover_North_Slope.tif), South and West Tundra (Tundra_Cover_Yukon_Kuskokwim.tif), Boreal Forests (Forest_Interior_AK.tif), and Mixed (Mixed_Landcover_AK.tif). North Slope Tundra included grid cells with 60% or more tundra north of 67°N. South & West Tundra included grid cells with 60% or more tundra south of 67°N. Forests represented areas of at least 40% Alaska’s forest cover. "Mixed" represents everything else not classified in the other regions. North Slope Tundra, South and West Tundra and Forests represent ~80% of the total area of Alaska.